Endonasal DCR can be done under local or general anesthesia. It is possible to open the lacrimal sac en-donasally with either conventional instruments or a laser. The laser procedure has the advantage that it can be done more readily as a day-stay procedure as there is a minimal amount of bleeding. The disadvantages of the laser are its expense, the precautions that need to be taken, and the fact that the results are not as good as with conventional instruments. Fig. 14.6 a Light transmitted from a light-pipe in the lacrimal there is a large agger nasi cell present. b Light transmitted from a light-pipe in the lacrimal sac when sac. (Fig. 14.6a, b). In approximately 8% of patients there is an agger nasi cell in this area and the light will be more diffuse. Very occasionally, the light is difficult to see and then the light on the endoscope can be turned off to help define where the bone is thinnest. If the light is diffuse and there is an agger nasi air cell, it will be necessary to open this up and go through it before going through the lateral wall and the lacrimal bone into the sac. It is best not to open the sac very high up without also opening it inferiorly, as a sump can form that collects mucus and can predispose to recurrent infection. If the procedure is done under local anesthesia, amethocaine drops are placed in the eye, followed by a nasal pack (1 cm ribbon gauze or a patte soaked in cophenylcaine or 6% cocaine) and an injection of 1% lignocaine injected through the surface of the conjunctiva around the sac. The latter may look alarming to the novice, but the conjunctiva is well anaesthetized with topical anesthetic drops. Discomfort can be minimized by injecting slowly to avoid pressure and by warming the local anesthetic to near body temperature. Local anesthetic is injected around and not into the lacrimal sac. After 2 minutes, a subcaruncular injection will help anaesthetize the bone around the lacrimal fossa. This is followed up 5 minutes later with an injection of 1% lignocaine and 1: 200 000 epine-phrine intranasally where the rhinostomy is to be made. The best way to expose the lacrimal sac with conventional instruments endoscopically is to incise the mucosa on the lacrimal crest, producing a posteriorly based flap (Fig. 14.7a, b). The anterior lacrimal crest is thick white bone, and the surgeon may recognize it as being the hard bone that they first approached with a sickle knife when they tried to perform a conventional uncinectomy and found that they could not incise this area (Fig. 14.8a-c). 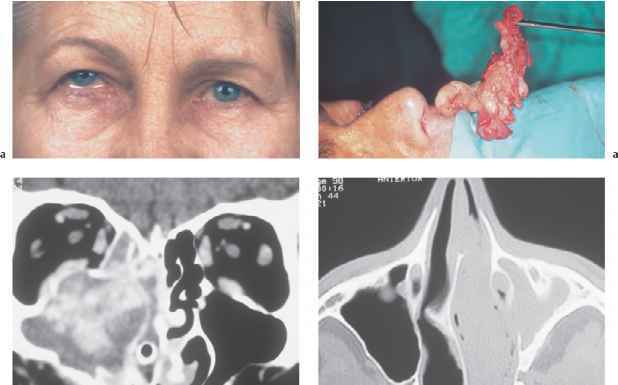 When a mucosal flap has been reflected, the white hard bone of the anterior lacrimal crest is readily seen and palpated. It is possible to remove this using a Kerri-son or sphenoid punch, which can remove the greater part of it in three or four bites. In order to obtain a large ostium, the upper part of the lacrimal crest also needs to be removed. In a child this can be removed with a sphenoid punch, but in an adult a coarse diamond burr is needed to remove it as it is very thick (Fig. 14.9 a, b). This exposes the lacrimal sac more widely, to the extent that the common canaliculus can often be seen. Just posterior to the hard lacrimal crest lies the uncinate process, and just lateral to that the thin bone that forms the medial aspect of the lacrimal fossa. The very thin bone over the lacrimal sac can easily be removed as it is paper thin. The sac has a magenta hue, and it can be divided vertically with either a sickle knife or a 45° beaver scalpel (Fig. 14.10a, b). Fig. 14.7 a External and b intranasal views showing forceps being used to help locate the lacrimal sac. This can help the novice to confirm the right area to expose. Fig. 14.9 a Palpating the anterior lacrimal crest with a coarse diamond burr. b Drilling the anterior lacrimal crest exposes the magenta-colored sac. Fig. 14.10 a Incising the lacrimal sac with a sickle knife. b Mucopus being released from an infected lacrimal sac.